StarWars.com aka TOS has just released some long buried recordings from a promotion they used to cripple the Illinois 1-800 system in the fall of 1979. You could call in and get one of five messages from either C-3PO, Princess Leia, Han Solo, Darth Vader or Luke Skywalker himself, that would tease the events of the upcoming movie. 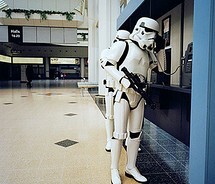 Stuck on Earth in 1980, this stormtrooper tries to work a rotary phone with armored gloves. To read the original story and listen to the recordings, click here. Suvudu posted an interview with former Star Wars author Michael A. Stackpole today that covers briefly his work with Star Wars on the X-Wing books and the chance he might write more. The interview also touches on his new upcoming Conan the Barbarian book which will help promote the new film. CPI and I agreed, after I saw the movie, that I wouldn’t so much novelize the script, as I would write the novel from which the movie was clearly taken. (Yeah, I know, a mindbender.) During the process I kept in mind a mythical reader who would read the book, then see the film, and say, “They should have stuck more to the book.” Because movies and novels are different media, changes had to be made. Stackpole’s Conan the Barbarian will be out on July 5th (and is available for pre-order on Amazon). 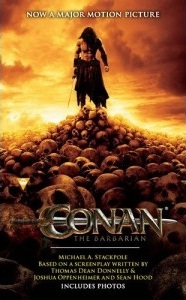 The new film Conan the Barbarian will be out August 19th. You can check out the full interview with Michael Stackpole here. Posted By: Skuldren for Roqoo Depot. We know the riddle of steel. Real Flying Motorcycles – Hoverbikes Are Here! When I was a kid there was a short lived spinoff from the original Battlestar Gallactica series called Gallactica 1980. It was terrible. The story, the premise, the acting, the special effects and even the lighting never seemed quite right. It only lasted ten episodes and this was in an age when a couple of pretty boys in an orange Chrysler with a rebel flag on the roof could pull top ten ratings. The only thing about the show that kept the young teenage fanboy glued to the set was the flying motorcycles. That’s right, they had flying motorcycles. Forget about the absurdity of them trying not to be discovered as aliens on Earth, trying to “blend in” with Earth culture, but still scooting around Los Angeles on flying motorcycles. I mean it. Just forget that it was ridiculous. They had FLYING STINKIN’ MOTORCYCLES and that alone was worth your undivided, sweaty little fanboy attention. 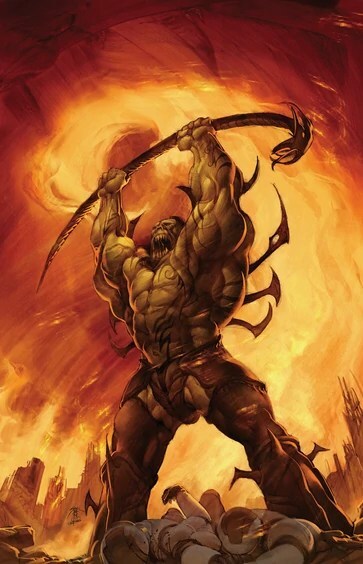 Reading the first arc of Invasion is like strolling down memory lane…only now you can see the Yuuzhan Vong as they wage war with their living biots, you can see the sadness and fear in their victims eyes, and the heroes no longer have mysterious faces left up to your imagination. With good art, a good story, and a good cast, Invasion is an entertaining series that does well in the old stomping grounds of the New Jedi Order. Click here to read the full review of Invasion: Refugees. Former Star Wars author Kevin J. Anderson will be at Dymocks bookstore in Melbourne, Australia today at 6:30 PM local time speaking about sci-fi writing, his new book Hellhole, and signing books. If you’re a lucky fan in the area, then stop by Dymock’s site for more details.